Some major turn-rounds are radically changing the political situation in Québec. Even from within the province, things remain unclear and it all changes very quickly. Within the span of a few months, a party was born, the Coalition avenir Québec (CAQ), a major crisis has shaken the Parti québécois, and the Action démocratique du Québec (ADQ) will disappear, swallowed by the CAQ. Let’s follow the career path of François Legault, leader of the brand new CAQ and credited with a substantial lead in polls, to understand who might become Québec’s next premier. The first time we heard of François Legault in Québec, he was a renowned businessman and head of Air Transat. This air transportation adventure allowed him to accrue a tidy sum and a solid reputation as manager. Boosted by his success, he was recruited by Lucien Bouchard in 1998 to be part of the Parti québécois’s government and appointed as education minister. The outcome of François Legault’s time as education minister from 1998 to 2002 is, to say the least, controversial. He was responsible for implementing a questionable reform of the education system which changed certain programs, but was mostly supposed to renew pedagogy. The general public reacted rather badly to certain measures (e.g., the withdrawal of marks from elementary school reports), but teachers were the ones who most vehemently challenged this important transformation. Project pedagogy, competence-based rather than knowledge-based learning, team teaching…the Ministry intrusion into classrooms and teachers’ practices was substantial and standardizing. Everybody remembers this education reform in Québec, namely because it still affects us today. Nonetheless, a number of people have forgotten other measures Mr. Legault introduced in education. I’ll name just two: performance contracting and success plans. These two attempts reflect François Legault much more aptly than the education reform. In the case of the latter, he was only responsible for its implementation, not its conception. Not only has the outcome of these two measures been negative (incidentally both were dropped or pushed aside), but they appropriately convey Legault’s mentality. He wants to impose the private sector’s methods on the public sector. Institutions that did not meet their objectives were punished with less funding, and yet this logic is absurd in a public system. Indeed, in the end, the citizens using the service and the front-line workers are the ones “punished” for the administration’s failure. 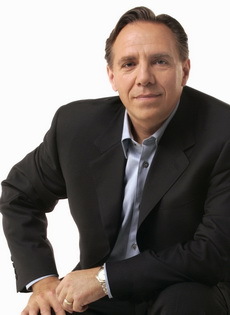 François Legault eventually transitioned to the health ministry and made similar attempts. Under the pretext of wanting to measure the health system’s “efficiency”, he implemented a series of evaluation and inventory measures which required even more bureaucracy and surveillance. The obsession with measurement required a host of technocrats who remain far away from the front-line services to the public. After a short time with the opposition, Legault left political life in 2009 to, as the cliché goes, “spend more time with his family”. Yet it apparently did not keep him busy enough since as early as 2010 he was noticed busying himself, gathering people around a budding new political organization. In 2011, he announced a grand tour to share the “new ideas” of the party he was preparing to found with federalist businessman Charles Sirois. The party they founded together had a “neither/nor” ideological basis. This not only reflects the union of its two founders—it is neither federalist nor sovereignist—but in addition, it candidly affirms it is neither left-wing nor right-wing and hopes to borrow “the best” from both ideologies. Subsequently, what constitutes the bulk of the CAQ’s program is no surprise. In education, monetary bonuses are in order for teachers, following their evaluation of course. In health, funding must follow the patient, in accordance with activity-based funding logic. Natural resources must be exploited as they currently are, but with government shareholder participation in the companies. In brief, all of Québec’s problems find their solution in a technocratic adjustment which adequately calibrates the relation between the State and the market. Societal project? National project? Common values to defend or put forward? No importance whatsoever, what we need is performance. Something should also be said of the internal structure of the CAQ. The way the party works fits perfectly with the ex-PQ minister. Members will not vote on the program, the leadership will impose it. No member will elect François Legault, nor the party’s leadership—the leadership will choose candidates rather than having riding associations decide. Yes, democracy is truly at the heart of the CAQ. Nevertheless, according to polls, this political offering has drawn broad support in the population. The Action démocratique du Québec, shilly-shallying ever since its leader Mario Dumont resigned, decided to put forth a proposition to its members concerning a merger with the CAQ. This ideological harakiri was devised to reach power as quickly as possible. Though it does not please the radical fringe of the ADQ, it seems an inevitable decision for most of its members. The Parti québécois’s leadership must be fuming, seeing one of its old ministers take over all the political space. Meanwhile, the party cannot keep from ripping itself apart. Very recently, many of its MPs have announced that they were joining those from the ADQ and deserting to the CAQ. Without having even gone through a single electoral campaign, the CAQ will have nearly a dozen MPs in parliament wearing its colours and advocating its new old ideas. Undeniably, it’s a good basis from which to start. Nonetheless, it in no way reduces the internal difficulties to come. Indeed, the CAQ’s membership of Parliament brings together people which only seem to share their desire to further their career.